Martin started his journey many years ago as a “yoga surfer”, studying with a wide array of yoga instructors across the United States. He believes Yoga to be an essential practice for maintaining a healthy life style. As a certified yoga instructor, he believes yoga is an essential practice for maintaining a healthy lifestyle. His alignment-based teaching allows students to experience inner growth and joy in their practice and lives. Martin’s first goal in teaching is for his students to feel more deeply connected to their body, breath, and being in a way that is healthy and joyful. In addition he holds a certificate for teaching chair yoga and uses meditation in both in his personal practice and in his yoga classes. 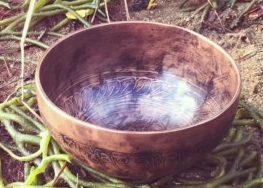 Along his journey, he found a singing bowl at a flea market. He soon started collecting singing bowls, ultimately using them as a focus for private meditation. While collecting bowls for some time, he has found that sharing the sound with others increases centering and focus and brings deeper relaxation. The bowls opened an entire new world of mediation that has led to the exploration of other meditation techniques.